What is the ankle support AM-OSS-05? Our ankle brace’s advantage is universal side – it is suitable for right and left leg. Laced system helps you fit your brace to every ankle shape. AM-OSS-05 brace is made of innovative fabric ActivSpace and AirDistance III. Two lateral anatomic-shaped splints stabilize joint effectively. Our ankle brace can be used in every athlete shoes. AM-OSS-05 ankle brace with lateral support, laced construction and spiral dynamic straps provide excellent ankle stabilization. AirDistance III is breathable durable lamination. Consists of 3 layers: external self-gripping polyamide, comfort foam inside and internal polyamide 3D fabric. This spacer fabric 3D provides high air permeability and minimal water and moisture absorption. Waterproof material. AM-OSS-03/CCA can be used prophylactically or after injury as an support. The ankle brace’s shape allows to use it in sport shoes. The brace is for both legs. The brace AM-SX-08 doesn’t limit the ankle range of motion and foot propulsion. We use our rule MiniMax (minimum device, maximum effect) to connect these two functions. Our ankle brace can be used after post injury treatment or as an prevention against the dangerous ankle inversion in sport trainings. M-OSS-05/CCA brace by Reh4Mat is one of the most advanced braces we offer. It is made of an innovative fabric ActivSpace. This fabric is non-elastic what improves stabilization and our skin is covered with airy terry cotton. One-side upright ankle brace with lateral anatomic shell KICKER is the best solution for active people. It stabilises and prevents against the twisting (inversion) of ankle joint. AM-SX-03 is a product equipped with the anatomically shaped plastic scales with appropriate stiffness. Scales are differently shaped for each leg and each size of orthese. This results in a product that perfectly stabilizes each ankle protects its twisting. Ankle brace AM-SX-04 including shin and foot orthoses ranks among the AFO group, and is one of the best and most universal stabilizing ankle braces on the market. 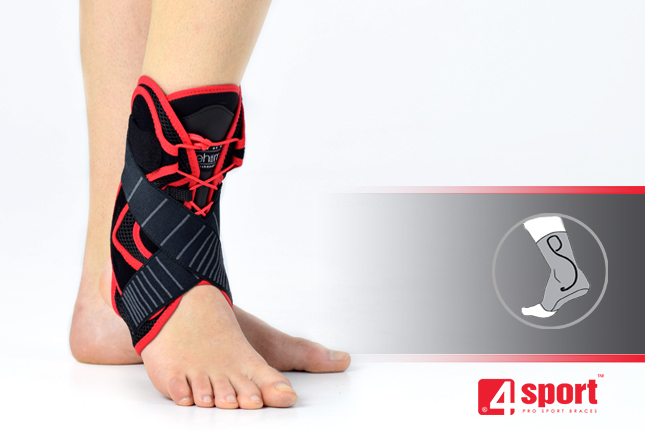 Our sport ankle brace AM-OSS-03 SCOUT is a anatomic-shaped solution for this kind of problems. Special anatomic support protects ankle joint in the frontal plane.